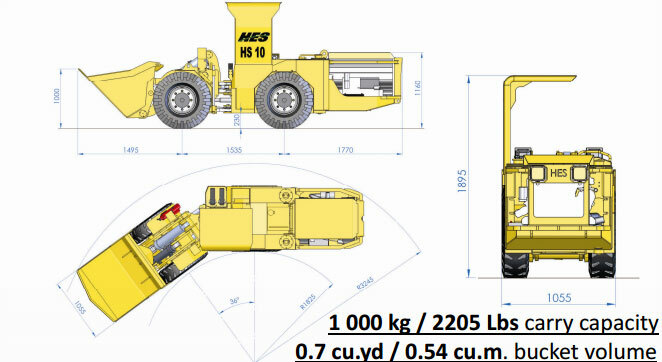 Our HES model HS 10 is an all wheel drive, articulated, reliable scoop loader designed for narrow vein mining. With a standard, bigger, 4 cylinders, air cooled Deutz engine, the powerful HS 10 is also ideal for high altitude operations. The rugged, heavy duty and stable HS 10 is designed with reliability, serviceability, productivity and ergonomics kept in mind. The use of high tensile and high abrasion resistant materials in critical areas makes the HS 10 a safe and reliable machine cutting down time and increasing productivity. With standard bigger traction tires, one pass loading is facilitated, increasing productivity and reducing operator fatigue.